GMS East-West Economic Corridor. 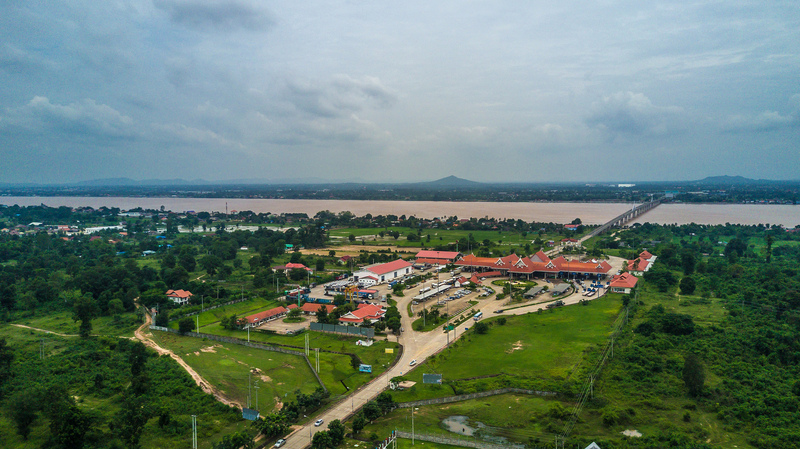 This aerial view of the border check point on the Lao side of the Mekong River shows the second Thai–Lao Friendship Bridge, which connects Mukdahan province in Thailand with Savannakhet in the Lao People's Democratic Republic. Photo: ADB. The Greater Mekong Subregion (GMS) Economic Corridors Forum (ECF) in 2018 marks the 20th year of the GMS economic corridor development approach since its formal adoption at the 6th GMS Ministerial Conference in 1998 to accelerate subregional development. It is the 10th year of the forum since its inaugural meeting in Kunming, People’s Republic of China (PRC) in 2008. This is also the first ECF following the 6th GMS Summit in March 2018, which adopted the Hanoi Action Plan 2018–2022 that has among its key elements a spatial strategy focused on the economic corridors. ECF-10 will review specific initiatives aimed at accelerating the development of the economic corridors in the subregion by effectively contributing to the pursuit of the 3Cs: connectivity, competitiveness, and community. It will define recommended actions for their refinement and effective implementation. Senior officials of the Greater Mekong Subregion will meet in Nay Pyi Taw on 12 December 2018 to review the draft Progress Report and Updated GMS Regional Investment Framework 2022, assess progress under the sector working groups, and discuss the project database and statistical database. The ECF-10 Host (Myanmar) and GMS Secretariat (Asian Development Bank) will also brief senior officials on the status and topics for discussion at the 10th GMS Economic Corridors Forum (ECF-10), as well as on the expected flow of proceedings and possible key points and issues that may be raised at the forum. Download the provisional program-agenda (137 KB). Presentation of the findings of the study on the Assessment of GMS Economic Corridors. Presentation of the concept and approach to the study for the development of certain sections/subcorridor of the GMS North-South Economic Corridor, which can be used as a template for similar studies for the development of other subcorridors/sections of the NSEC or other GMS economic corridors. A panel of representatives from the GMS countries will discuss logistics development as a key ingredient in the development of the GMS economic corridors. The Working Group on Health Cooperation (WGHC) to present on the latest draft of the GMS Health Cooperation Strategy 2019-2023, including on planned interventions in border areas, with migrant and mobile populations, and health impact assessments in Special Economic Zones (SEZ). The International Organization for Migration (IOM) will present on its ongoing program, Poverty Reduction through Safe Migration, Skills Development and Enhanced Job Placement (PROMISE). The presentation will include an analysis of labor migration in sections of GMS corridors with a comparative overview of Cambodia-Thailand and Myanmar-Thailand corridors, focusing on contextual challenges, IOM will share examples of IOM’s work with private sector partners on skills development for increased competitiveness and mobility, and related opportunities for GMS governments and the private sector to promote international investment and access to the global markets. Participation is by invitation only. Target participants are Ministers from GMS countries; GMS National Coordinators and Senior Officials; other officials from concerned ministries/agencies; local and provincial authorities; officers/staff of the Asian Development Bank (ADB); representatives from the private sector; and development partner organizations. The ADB delegation will be led by Southeast Asia Department (SERD) Management. Send inquiries to the GMS Secretariat.